Concept: Host a digital sweepstakes to reward consumers and fans during the holidays with prizes and exclusive content. Objective: Increase consumer engagement and drive repeat website visits and conversions during the holiday shopping season. Circulon is asking their fans to stock up on all their gourmet needs this holiday season, starting with the chance to win some free Circulon cookware to start the season off with a bang. 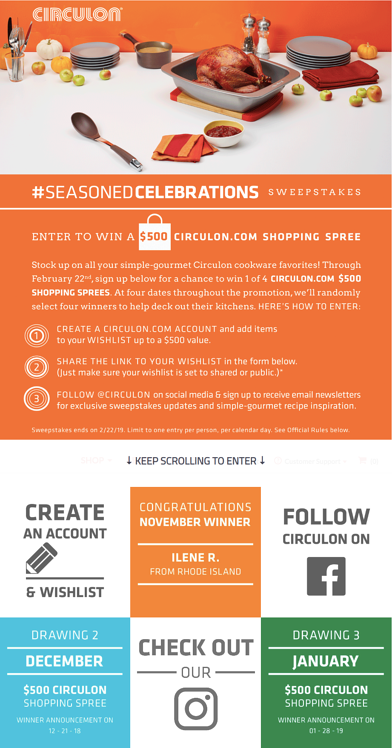 Now through February 22nd, fans can sign up for the chance to win 1 of 4 Circulon.com $500 shopping sprees. To keep the season of giving going, they will be announcing winners on four separate dates, selecting four winners that will be able to deck out their kitchens with the best. Pulling inspiration from a holiday wishlist, the Circulon team created a sweepstakes centered around their fans gourmet wishlists. To enter, fans will need to create and share their cookware wishlist with friends and family for the chance to win. You can check out the sweepstakes and Circulon’s unique take on the wishlist HERE. Circulon’s DCI score is a combination of an Engagement Score (ES) of 256 and Virality Score (VS) of <25. Their campaign is benefiting from repeat campaign visits, campaign clicks and submissions.Check out more details below on best practices you can incorporate into your digital campaigns to increase Engagement and Virality. Leverage technology to engage consumers. Circulon made great use of the Wyng Platform and our form capabilities to streamline the submission process for consumers, facilitating more time spent on site through an improved overall campaign experience, as well as optimizing the first-party data their team was able to capture through a fun and engaging holiday microexperience. Keep your prizes aligned with your brand. Having an over-the-top prize doesn’t always ensure campaign success, after helping brands run thousands of campaigns it is clear that the value of a prize doesn’t have to be high, but it should align with the heart of your brand or the campaign’s theme. Keep up the holiday cheer. Circulon ensured that their campaign had legs by spreading out the announcement of winners across the holiday season and into the new year, pairing their campaign with their unique hashtag to maintain social momentum, as fans continued to create and share their wish lists using #SeasonedCelebrations. Download our Fall and Winter Holiday Lookbook to see how your teams can still make the most of the holiday season.